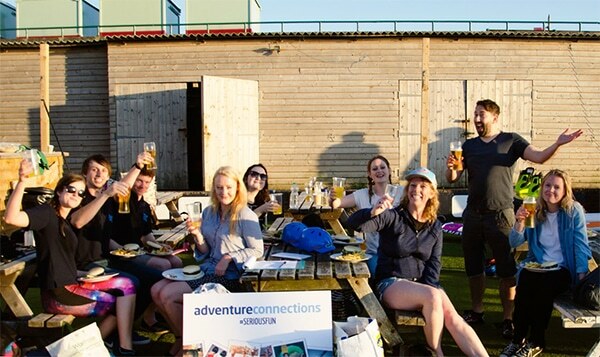 I’m always up for an adventure and trying out something new; which is why a couple of Thursdays ago, on a beautifully sunny evening, I headed down to Hove Lagoon to spend an evening with the guys at Adventure Connections*. 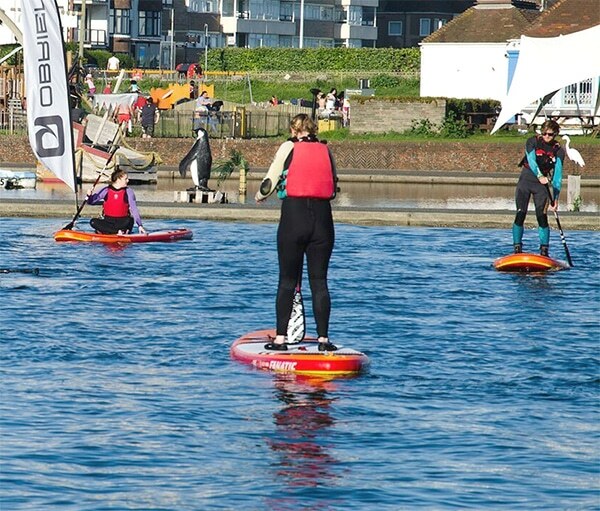 They’re a Brighton-based events management company that organise stag, hen and corporate events and they’d invited some local press and bloggers down for an evening of fun learning how to paddleboard and try out wakeboarding! I must admit, I didn’t really look into what either one involved before heading there, otherwise I may well have changed my mind! Once I was suitably attired (and then had to “quickly” take everything off again for an emergency wee), I went downstairs to join the others. 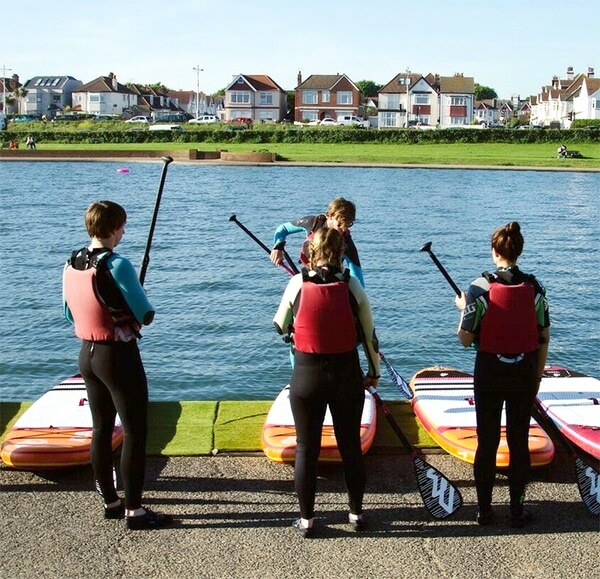 The guys from Adventure Connections were also joining us and we split into two groups 🙂 I joined the paddleboarding group first and got fitted with a buoyancy aid, ya know, just in case; although I was soon to find out the water was only about three feet deep! We had a couple of games of bulldog (where you have to get from one side to the other and there’s someone in the middle trying to catch everyone), but I stayed firmly sitting down!! I really liked paddleboarding and would definitely want to try it again, although not in the sea because the lagoon was incredibly calm and it still felt super choppy to me! 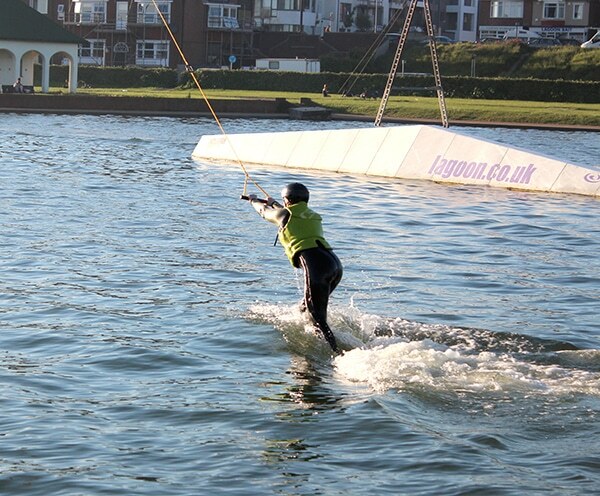 We were then asked if any of us wanted to try wakeboarding and I (naïvely) jumped at the chance! 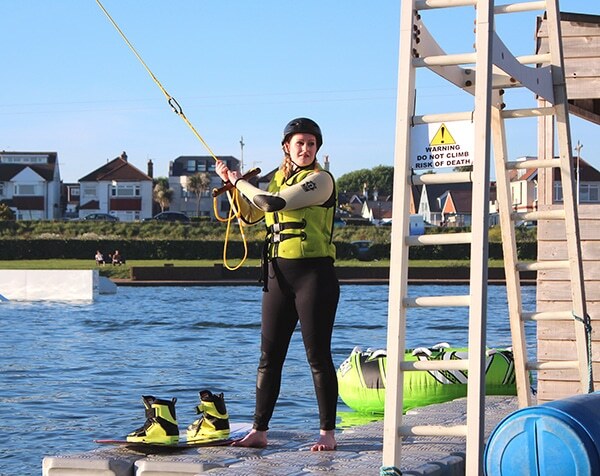 I was strapped into the wakeboard by my feet and had to hold onto the handle of the rope that would pull me along! The idea is that you almost lie on your back in the water with your knees up to your chin and your feet under your bum. When the rope starts to pull you, you unfurl yourself into more of a crouching position and then finally stand upright with your leading foot in front (so you’re sideways on). I say that like I’m some sort of expert wakeboarder, but I never really got the hang of it. I managed to faceplant the water twice and somehow flip into the water backwards at one point too. This photo was taken just before I completely ungracefully fell into the water. 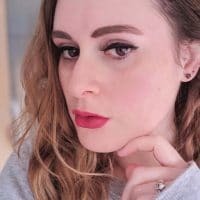 At this point, I want to be completely honest with you and say that I felt a little bit let down by the attentiveness of the Hove Lagoon staff. Considering how dangerous these activities could be if anything went wrong, I didn’t really feel like they spent enough time explaining exactly what to do before doing it (for example, we weren’t shown how to stand up on our paddleboards before we got on the water. It was almost assumed that we all knew how!). I was also left to find my own safety equipment and at no point did anyone check to make sure it was done up correctly or the correct fit. I also feel it necessary to explain that all the staff at Adventure Connections were absolutely lovely though and went above and beyond to make sure we had a great time and I wouldn’t hesitate using them to organise a group activity, I’ll just be picking one that keeps me firmly on dry land. Unsurprisingly, the chocolate-making activity has definitely caught my eye!! Thank you so much guys for inviting me down and letting me try out something new! 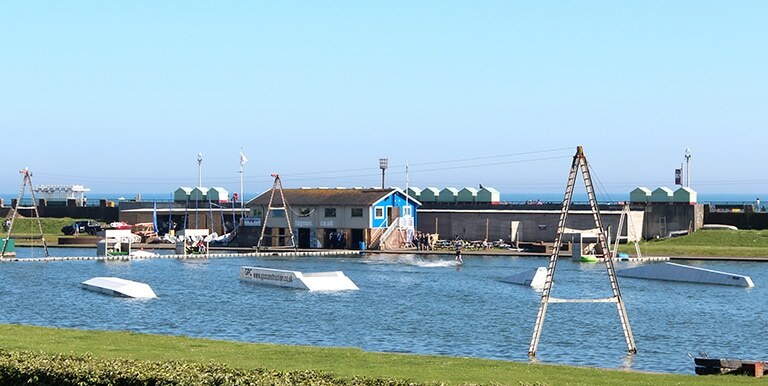 *I was invited by Adventure Connections to review their wakeboarding/paddleboarding events but all views, and fear of water, are my own. Thank you. I’m definitely a land lubber!! I had to give it a go before saying I didn’t like it, what if I was a natural and loved it?!? Been loving seeing your surfing pics and vlog!! High five!! Great read Holly! I’ve never tried paddle boarding, but went knee boarding and wake boarding a few weeks ago! We started from a sitting position before being pulled by the cable… still really hard though! 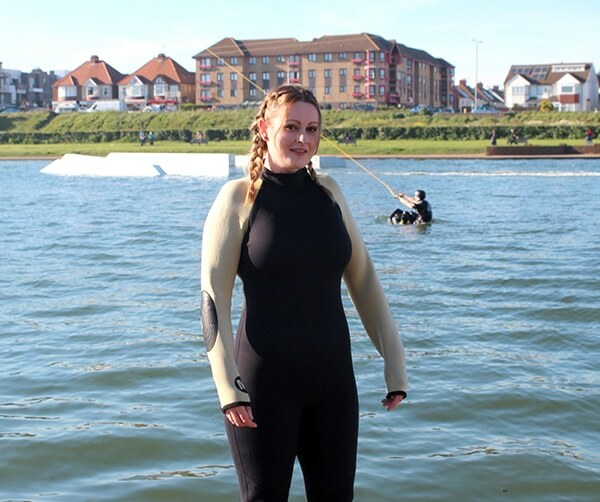 You should give knee boarding a go next time!